November 21, 2004. A new look for the Palace of Fine Arts, Lyon Street at Bay. Detail The Palace of Fine Arts, with its crumbling dome and enduring Corinthian columns, is a remnant of the 1915 Panama-Pacific International Exposition, when the City hosted nations in the Marina. With the Exposition San Francisco trumpeted its rise from the ashes of the 1906 quake and fire. The structure was designed by Berkeley architect Bernard Maybeck and was intended to be temporary. It was rebuilt in the 1960s. More than a symbol, today the Palace of Fine Arts is a tranquil park replete with natural beauty. The lagoon here is favored by many ducks and swans, in addition to some amorous turtles. 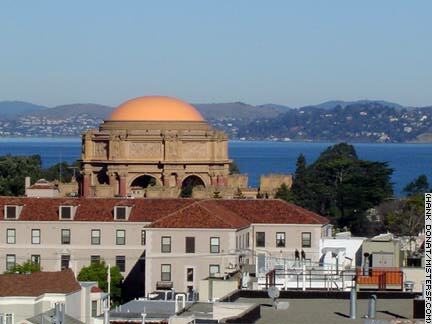 By 2002, a new renovation of the Palace of Fine Arts was sorely needed, both in the dome and along it's disintegrating walkway. Gone now after a beautiful restoration, a hideous chain link fence was a temporary safety measure. The needed repairs to the lagoon were underway in August, 2005.